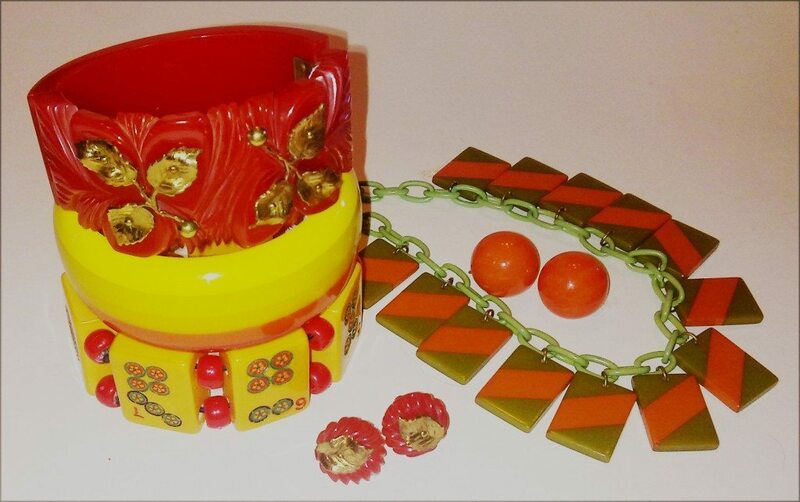 The production of Bakelite jewellery began in the early 1920s. Bakelite could be made in bright vibrant colours, yellow, butterscotch, red, green and brown being the most common. Bakelite could be transparent or marbleized by mixing various colours, it was moulded, carved, painted and made into fabulous jewellery pieces which today are highly collectible. In 1910 Dr. Leo Hendrik Baekeland started the Bakelite Corporation after inventing Bakelite, which was the first completely man-made substance. For the first 10 years they made automotive and electrical parts, however by 1920 the production of Bakelite jewellery had begun. There are other types of Bakelite but the formaldehyde formula produced by Baekeland gave form to Bakelite jewellery, which is most highly sought after today. 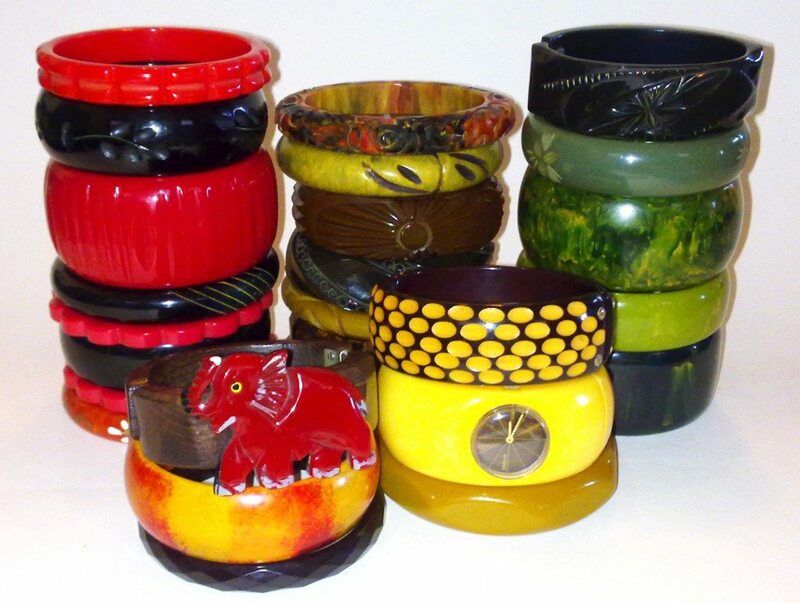 Bakelite was made into every type of jewellery, bracelets, necklaces, rings, earrings, fur clips and buckles. The most popular pieces today are the heavily carved bangles, some hinged which are called clampers and huge necklaces and the most desirable colours are red, black, orange and the rare blue. 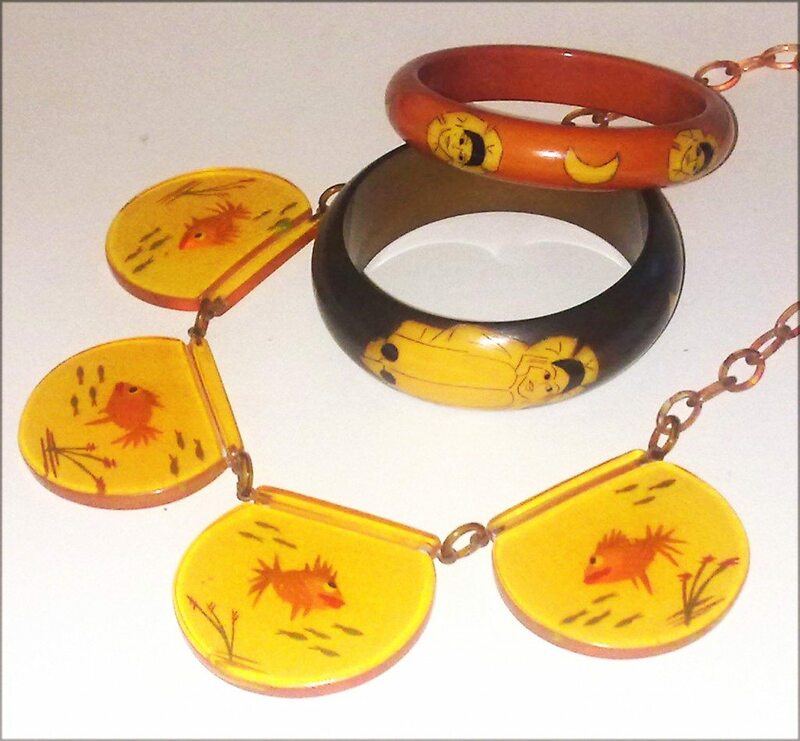 During the Great Depression large amounts of Bakelite jewellery was produced, it was affordable and cheerful in bright colours and often in whimsical designs. 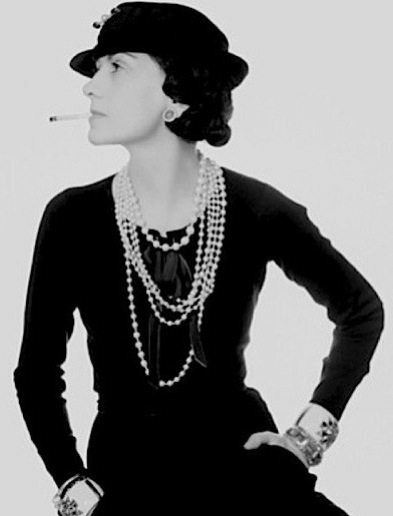 Bakelite jewellery entered Haute Couture with Coco Chanel’s inclusion of Bakelite pieces in her 1927 accessories collection. This continued through many of her collections and there are photos of her wearing many Bakelite pieces herself. Many costume jewellery designers used Bakelite, including Hattie Carnegie, Elsa Schiaparelli and others who produced amazing pieces. Clear Bakelite, often called Prystal was invented in this period, these pieces today have often mellowed to a pale yellow and are referred to as Applejuice. Reverse carved pieces are highly desirable where a design, often animals or flowers have been carved into the back of the Bakelite and hand painted and coloured or laminated pieces where two colours are seamlessly joined together. During the WWII most production of Bakelite jewellery ceased as the material was used to produce telephones, goggles, etc to support the War effort. 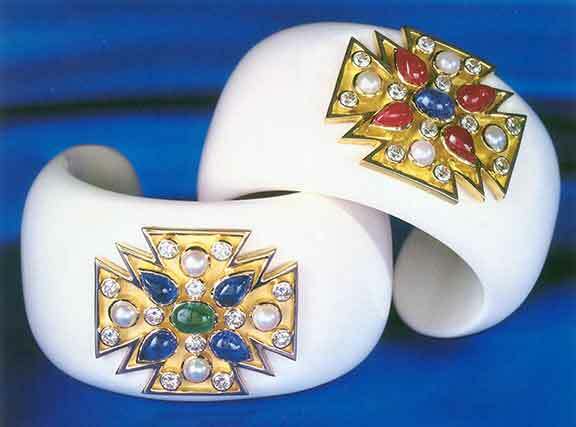 After the War many new materials, including plastics came along and Lucite has also been fashioned into amazing jewellery pieces. Bakelite jewellery came back to prominence again with the auction by Sotheby’s in 1987 of the collection of Andy Warhol after his death. 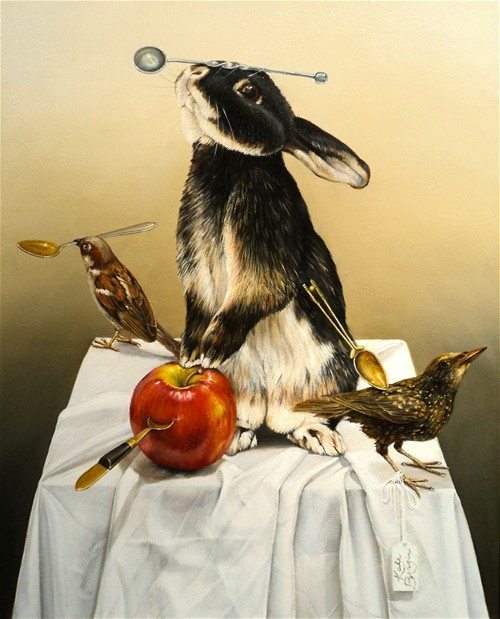 Since then there have been several large collections dispersed the most recent of these being the Massellis and the Susan Kelner Freeman collection, with many pieces fetching over $6000 USD. Bakelite jewellery is very sought after today, it is very wearable and many pieces are unique, statement pieces. As there are reproduction pieces and many pieces are marked with the wrong date, it is always best to buy from a reputable dealer. There are many tests for Bakelite, including hot water tests, simichrome paste, clunk tests, etc. however there is no substitute for handling vintage Bakelite and studying the designs and carving. Beware of pieces that are heavily carved and have a fine white powder look in the depths of the carving, these are generally reproduction. To care for your Bakelite, never use modern cleaners as they can discolour the piece. Simichrome paste (available from some hardware stores) can be used to remove fine scratches from Bakelite and olive oil can be used to restore lustre to many pieces. Dianne Pickett is the Proprietor of Online Antiques, a Victorian based online antique dealer. Online Antiques specializes in Art Deco, Art Nouveau and 20th Century, all facets including furniture, lighting, decorative arts, figurines, jewellery and clothing. We are a member of the Australian Antique and Art Dealers Association and exhibit at various fairs and show across Australia and at the Malvern Antique Market. All of our stock is imported from Europe and the United States.